Seen Alien: Covenant? Remember the creepy sketches pinned all over the living space of David (the crazed AI played by Michael Fassbender)? Now artwork used in the Ridley Scott film has been collected together in a lavish new book. 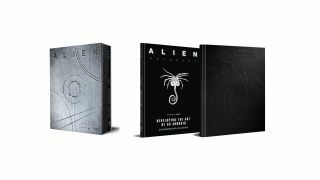 Alien: Covenant – David’s Drawings brings together two volumes within a slipcase. Developing the Art of an Android interviews Dane Hallett and Matt Hatton, the pair charged with working in a single style to create the ink/charcoal sketches. Then there’s a “sketchbook” featuring hundreds of examples. Beginning with innocent images of flora and fauna, it progressively becomes more and more morbid, taking in decapitated Engineer heads, Alien eggs sliced in half and conjoined foetuses. It’s the perfect thing for a goth coffee table!